Life as a teenager is already hard enough but imagine going to High School as a gorilla. You've got all those hormones making your emotions run high, add this to the fact that people tease you every single time you eat a banana and it's enough to make you head back to the jungle. It wouldn't be so bad if everyone else at school was some kind of hairy primate to. In fact, it would be kind of nice. After all, what ape is tougher than a gorilla? Not orangutangs, they're too chill. Not howlers, they're all bark and no bite. You do have to watch out for those chimps but as long as you keep them fed, they're usually in a pretty good mood. Anyway, I digress but what do you expect from a gorilla writing a costume description? Yep, that's right! This gorilla overcame the turmoil of high school and is slowly recruiting human teens to the wonders of going to school as a gorilla. Sure, it's a challenge both physically and mentally. These gorilla paws don't hold a pen well and people get mad when you fed on their food even if it's subpar cafeteria pizza. But hey, here I am today, happy and healthy. No one even made fun of me last week when I brought in banana bread to share! 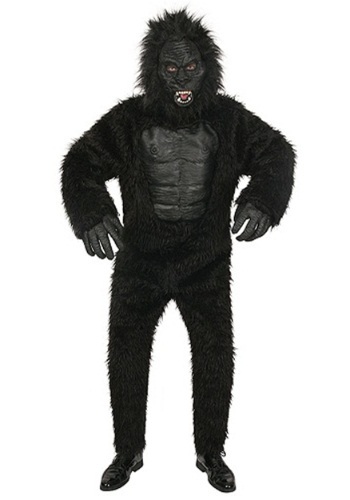 So, if you're ready to ally yourself with rough teenage gorillas then you'll want this quality gorilla suit. The jumpsuit has a latex muscle chest and secures in back with hook and eye touch strips. You'll also get the full mask with eye holes and latex hands that will make your look complete. It's about time the world got to know more grade A apes!